In 1936, Lillian Rosengarten and her family fled Nazi Germany for New York. But even there, the legacy of the Nazis' brutality continued to cast a shadow over her family for many decades. 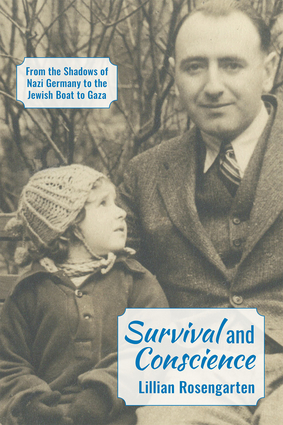 In Survival and Conscience, Rosengarten describes how she faced those challenges within her own life while gaining empathy for the struggles of others, realizing that all forms of extreme nationalism and hatred must be vigorously resisted. Like many other refugees from Nazism and survivors of the Holocaust, Rosengarten became a strong advocate of Palestinian rights. In 2010, she joined the "Jewish Boat to Gaza," designed to break Israel's punishing blockade of the Gaza Strip. Though the Israeli Navy obstructed their humanitarian mission, nothing can stop Lillian Rosengarten's inspiring story of love, self-discovery, and activism. Lillian Rosengarten is a clinical social worker and psychoanalyst. She is a poet, writer, mother, grandmother, and progressive human rights activist. Her writings have been published on Mondoweiss.net and elsewhere. Rosengarten practices meditation and has traveled broadly, pursuing her interest in Buddhism and other ways of understanding the world.